How to Preview the Backup File with .bak Format? Home> Resource> Android Backup> How to Preview the Backup File with .bak Format? With the popularity of digital devices like computer, mobile phones, etc. in the daily life and work, people need to deal with all kinds of electronic files with various formats. It is known to all that not all e-documents can be opened on your personal PC directly, in most situations you need to change its extension or asking help from small tools for viewing. Obviously, if you're not familiar with these kinds of format, you may need to spend some time on study it and this is daunting and time-consuming, right? So, in this article, we could like to focus on the file format of .bak, and show you how to open or preview Bak file on your desktop computer directly. How to open .bak file easily? Generally speaking, .bak file is a backup file extension, which is created by automatic backup when an application is editing, overwriting, etc. as a part of an auto-save procedure. It always happens when a program or a app is being updated, and you can choose to close the auto backup function in the program as you like. What's more, .bak file can also be generated by some special tools, like MobiKin Assistant for Android. When you are choose to backup your Android contacts or messages to the desktop computer, you can choose ".bak" as the target format. Now, you may know that lots of file can be saved as a bak file when you're not aware of it, and you can also manually add the .bak filename extension to create a bak file by yourself. But you should be noticed that .bak file can't be opened without any settings. So if you wish to open a .bak file on your desktop computer, you can follow the solutions as following contents. How to Open Bak File by Yourself? Generally speaking, you can open a .bak file by changing the file extension. For example, if the bak file is the backup file of a MS Word document, you can change the extension from .bak to .doc or .docx, then you an use MS Word to open the bak file well. Similarly, you can open the bak file by changing its extension to .dwg, .jpg, etc. easily. However, if the bak file is encrypted, this solution may not useful here because you'll just see a mess in the file. However, if you don't know what the original program is here, then you need to find a app to help you. Here, we could like to recommend free File Viewer for your reference. With it, you can open and view up to 200 types of files on your desktop computer as you like. Now, just download Free File Viewer here: https://file.org/free-download/free-file-viewer. How to Preview A Backup File with .bak Format? We have mentioned in the above content that an encrypted .bak file cannot be opened by simply changing the file extension, especially the file is generated by a professional backup program like MobiKin Assistant for Android. But it doesn't mean you have on way to preview it. Here, you can use the same tool to restore the .bak file, and then you can preview the contents in the program as you like. Step 1. Download and install the program on your computer, then choose "Super Toolkit", and select "Restore from Backups" in the main screen. Step 3. 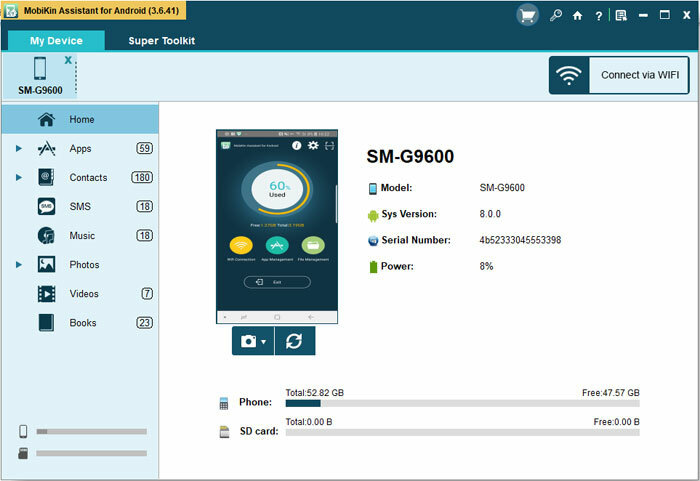 If you wish to restore any data to your Android devices, you can connect your Android to the computer, and hit "Restore" button after the reorganization.